Personality: Ariella is bouncy and tends to be loud. She has a short fuse, but her temper tends to fade as fast as it was triggered. She enjoys helping people but also loves causing destruction and mayhem. This has resulted in a rather unique problem as she is often seen as more of a hindrance than a help in situations. She relies heavily on herself, as she doesn’t like disappointing people. She seems very carefree but tends to take criticism to heart. She has a short attention span and has difficulty focusing beyond what she is doing at the moment, making long-term plans a struggle for her. The only place she retains focus is in her magic studies and she works very hard to improve them at every opportunity. For most of her life, she held no strong feelings on slavery and her family had several servants, many of which she was friends with. She held very little interest in politics and tended to remain clueless about other countries’ hierarchies however with her time spent in Reim, she has become more involved politically. At events, she is often seen as the life of the party, though to her parents’ displeasure, she often behaved inappropriately for more sophisticated events. She detests anyone trying to tell her what to do and much prefers to do things in her own way and in her own time. Likes: Ariella likes animals. Growing up, she could often be found trying to tame wild creatures or bringing home stray cats. Ariella also enjoys stargazing. When she was younger, she and her father would go out and stare at the sky at night and he would smile at her attempts to draw pictures with the stars. Dislikes: Ariella dislikes fish, the smell and feel of the slimy scales disgusting her and the taste of it making her stomach turn. She also dislikes sand, as it managed to find its way in places it should not be and took ages to remove from her hair. Phobias: Ariella is terrified of frogs. When she was younger, her brother, Adius, had thrown her in a pit and dumped several buckets of frogs on top of her. To this day, she still shuddered in the presence of frogs, able to feel their slimy skin sliding over her. She also has an irrational fear of quicksand and is convinced that any sandy terrain holds nothing but terror for her. Ariella is also scared of pure darkness. Under the night sky, the moon and stars were there to guide her, but if a room is utterly dark, she fears that some unknown monster will devour her. Adius had often tortured her by locking her in a closet beneath the stairs in their home and taunted that the Darkness would devour her. Aspirations: Ariella is driven by the desire to become the best magician ever. Her parents often made their disproval of her behavior quite apparent and showed favor to her brother, who had quickly raised through the Kodor in the Academy. Ariella wanted nothing more than to best him, as it was the arena that her parents were most focused on. She strives to prove to her parents that she can focus enough to become a better magician than Adius and maybe one day run the Academy. Though her childhood desire was to become a magi, she had since become old enough to try for a more achievable goal of simply being an outstanding magician. Special Traits: Ariella has a long black tail she often keeps hidden, a result of another of her brother’s pranks gone awry. Her parents were unable to find a way to reverse the spell he had used and had hoped it would just fade on its own, but after several years simply became accustomed to helping her hide it. Appearance: Ariella is slender and of average height. She walks with an almost feline sway to her steps and when fighting is very fluid. She typically wears basic pants and shirts, not being restricted to magician robes as she has not yet gained entrance to the academy. When at home, her parents insist she wear clothing more fitting for her status in the community but she has been known to dress in servants clothes so she could sneak about. History: Ariella grew up in the shadow of her older brother, Adius, and was often brushed off by her parents because she had not shown the same amount of promise as he had at a young age. Adius often went out of his way to torture her, as older brothers do but also did occasionally try to help her with her studies. As she got older, her skills improved, but her parents had already given up hope that she would ever be more than just a shade of what her brother was. Her childhood was not lonely, as she often befriended the servants and their children. She was also fairly popular with several of the local children due to her destructive and daring ways. She could often be found leading “adventures” through the yards and fields, the other children racing behind her. As she grew older, she asked about joining the academy, but her parents were afraid she would be an embarrassment. When she was 15, her parents insisted it was time for her to “grow up” and begin taking her studies more seriously. After several tutors quit due to her stubbornness regarding what she wanted to learn and how, her parents told her that if she were so restless, she should go out in the world and see what it could teach her. After what she perceived the ultimate rejection from her parents, Ariella vowed that she would go out into the world to find less restrictive means of learning magic and she would not return until she had become worthy of her parents’ affection and of entrance to Academy City. Her parents seemed supportive in their own way, providing her with plenty of money and a list of places she might visit before dismissing her off hand. While Adius had come home to see his sister off on her journey of discovery, her parents were conspicuously absent and she rode away from her childhood home with a heavy heart filled with rejection and determination. For months, she was bitter at her parents rejection, but soon the desire for their acceptance made her bury that rejection and throw herself into finding out all she could about magic from anyone she could, carefully avoiding Magnostadt to ensure that she would not tarnish her family name if she were to fail. In her time spent traveling, Ari has visited several places, but finally settled in Reim for an extended period of time. There, she met a magician by the name of Azix Niraj who helped to expand her views on magic. She has also since gained a farm and helps out those less fortunate by allowing them to stay there and learn to work the land and support themselves while their children gain an education. Description: Using her extensive knowledge of the magical arts and rukh, Ariela is able to create magic-infused items. Diversity – Ariella can craft magic items for any single magic type she has used. Extensive Knowledge – Ariella’s interactions with magic give her an advantage when faced with magical dilemmas or when facing new magic types to better understand how they work. Description: Diplomats are good at making treaties and influencing decisions of rulers and government groups. Swaying Argument - Growing up in an influential family in Magnostadt, Ariella knows how to word her arguments to have the most impact, helping her to sway the opinions of those around her. Garner Respect - Knowing the importance of appearance, posture and knowledge, Ariella commands respect when she enters a room by having relevant knowledge and a strong presence. [b]Description:[/b] Ariella casts a 5 meter wide sphere of electric magic at 10m/s up to 10m away, dealing D-tier damage each turn to anything within the sphere. This spell can be sustained. [b]Description:[/b] Ariella casts a hollow sphere of electricity up to 5 meters across with a 3 cm wall that can form at 10 m/s within 10 meters of herself, capable of trapping opponents inside. If any edge of the sphere is touched, the person will have a limb numbed for up to 2 posts, reducing their movement speed by 5 m/s. [b]Description:[/b] Ariella uses a ball of magoi 5 meters wide traveling at 10 m/s up to 15 meters away to encourage the wounds of anyone it touches to mend, healing up to D-tier damage over 2 posts. Ariella can control the travel path of the ball of magoi. [b]Description:[/b] Ariella casts a hollow sphere of electricity up to 10 meters across with a 3 cm wall that can form at 15 m/s within 20 meters of herself, capable of trapping opponents inside. If any edge of the sphere is touched, the opponents will have 1 limbs paralyzed for up to 3 posts, reducing movement speed by 5 m/s. [b]Description:[/b] Ariella casts a 10 meter wide sphere of electric magic at 15m/s up to 20 meters away, dealing C-tier damage to anything within the sphere. [b]Description:[/b] Ariella uses a ball of magoi 5 meters wide traveling at 15 m/s up to 20 meters away to encourage the wounds of anyone it touches to mend, healing up to C-tier damage over 2 posts. Ariella can control the travel path of the ball of magoi. [b]Description:[/b] Ariella uses the seeds of a strong vine to grow two vines up to 5 meters long apiece within 20 meters of herself. The vines grow at 15 m/s and twine around two limbs, immobilizing the opponent(s) for up to 3 posts. [b]Description:[/b] Ariella forms 2 balls of magoi .5 meters wide capable of moving at 15 m/s to follow any life signatures within 20 meters of herself. [b]Description:[/b] Ariella casts a wall of electricity up to 15 meters wide and tall and one meter thick which can move up to 20 m/s up to 30 meters away from her. If anything touches the wall, it will take paralyze two limbs for three posts, reducing movement speed by 10 m/s. [b]Description:[/b] Ariella tosses out seeds of an exotic flower and encourages them to grow at 20 m/s within 30 meters of her that is approximately 5 meters across. Anything caught within the small field of flowers will notice a pleasant, sweet aroma. The aroma causes a person to suffer hallucinations for 4 posts, reducing their movement and ability speed by half. [b]Description:[/b] Ariella encourages a root in the ground to grow at 20 m/s within 30 meters of herself, causing the root to shoot upward up to 15 meters into an opponent, dealing B-tier piercing damage. [b]Description:[/b] Ariella uses a ball of magoi 5 meters wide traveling at 20 m/s up to 30 meters away to encourage the wounds of anyone it touches to mend, healing up to B-tier damage over 3 posts. Ariella can control the travel path of the ball of magoi. [b]Description:[/b] Ariella directs the rukh to encourage the growth of thorny vines. These vines shoot from the ground at 20 m/s and cover an area 5 meters across, crossing over themselves to create a field of thorny vines capable of inflicting up to B-tier damage to anyone trapped in the area. [b]Description:[/b] Ariella directs the rukh to use electricity to damage any items including wood, metal or cloth, forming a field at 20 m/s in a 10 meter area within 30 meters of herself, dealing B-tier damage to the items. This ability does not affect flesh, only items. [b]Description:[/b] Ariella directs the rukh to gather an immense amount of electricity in an area within 30 meters of herself, causing a lightning bolt 10 meters wide to strike at 20 m/s, dealing B-tier damage to anything struck. [b]Description:[/b] Ariella creates a 5 meter long, 1 meter diameter serpent of flame that moves at 20 m/s within 30 meters of herself, inflicting B-tier damage to anything it touches. [b]Description:[/b] Ariella forms a 5 meter tall cyclone that is 2 meters across. This cyclone moves at 20 m/s and can be freely directed anywhere within 30 meters of herself. When the cyclone touches someone, C-tier damage is inflicted and the person is thrown back 10 meters. [b]Description:[/b] Ariella creates an ice spear 1 meter long and 3 cm wide which travels 20 m/s in a chosen direction up to 30 meters away, inflicting B-tier damage to an opponent. [b]Description:[/b] Ariella summons a single Plague Sprite that is 10 cm tall. The Plague Sprite may travel at 20 m/s up to 30 meters away and infects anyone it touches with a plague that liquefies skin and muscles. The plague inflicts D-tier damage and lowers movement and ability speed by 5 m/s each post for 4 posts. [b]Description:[/b] Ariella creates a large cloud of acidic poison at 20 m/s that is 10 to 15 meters across and 3 meters tall anywhere within 30 meters of herself. Anything the cloud touches causes B-tier damage. [b]Description:[/b] Ariella uses gravity magic to gather pieces of earth to create an image of Ugo at 20 m/s that is 10 to 15 meters tall and can be freely directed within 30 meters of herself. This construct causes anything it touches to be knocked back 10 meters at 20 m/s. [b]Description:[/b] Ariella uses a ball of magoi 5 meters wide traveling at 25 m/s to encourage the microscopic bacteria in the blood of an opponent within 40 meters of herself to grow at a rate of 25 m/s, causing massive swelling and rupturing, as the bacteria can grow up 25 meters in size. [b]Description:[/b] Ariella gathers the rukh and directs it into a single strike of lightning .5 meters wide to strike at 25 m/s within 40 meters of herself. On contact with either an opponent or the ground, the area becomes charged with electricity in a 5 meter radius of the strike point, dealing A-tier damage to anyone within the affected area. [b]Description:[/b] Ariella uses a ball of magoi 5 meters wide traveling at 25 m/s up to 40 meters away to encourage the wounds of anyone it touches to mend, healing up to A-tier damage instantly. Ariella can control the travel path of the ball of magoi. [b]Description:[/b] Ariella creates a .5 meter ball of magoi that travels at 20 m/s to seek out life signatures within a 10 meter area, allow Ariella to deal A-tier damage to a single chosen target. [b]Description:[/b] Ariella directs the rukh to a Perfect Storm 50 meters x 50 meters x 50 meters at 30 m/s. Anything caught in this storm will suffer Omega-tier damage, while also finding themselves disoriented for a single post as a passive effect of the magic type. [b]Description:[/b] Ariella directs the rukh to summon a 10 m sphere of magoi at 30 m/s. Anything touched by the sphere will be fully resurrected. The sphere can be freely directed within 50 meters of Ariella. [b]Appearance:[/b] A small pewter pendant in the shape of a heart cradled by hands and a crown atop it. In the center of a heart is a deep amethyst gem. The pendant is approximately 4 cm across and is attached to a 50 cm long pewter chain. The magical circle is imprinted on the back of the heart but is no longer able to be used. 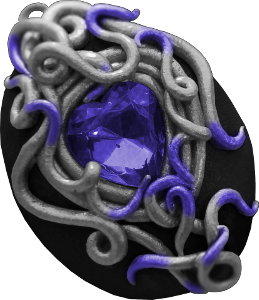 [b]Appearance:[/b] This black onyx pendant has an amethyst jewel locked in place by an intricate silver design reminiscent of a series of snakes, or a Medusa's hair. [*][b]Gravity Lock:[/b] By paying 15 magoi, the user is able to create a dome of space around them that creates a downward force and immobilizes everyone/everything in place. This dome begins .3-5 meters away from the user and ends 10-15 meters away from the user, and is created at 20 m/s with a B-Tier effectiveness. Cool-down is 5 posts. [*][b]Fate's Intervention:[/b] By thinking of a loved one(s), the user is able to view the(ir) portrait(s) in the picture on the interior. Only those who are alive are able to be seen in the portraits. By paying 10 magoi, the user is able to create a construct of force in the shape of that individual at 15 m/s, which can strike out at 15 m/s and impart C-Tier damage. Cool-down after paying magoi is 3 posts. Switching portraits does not activate the cool-down. [b]Description:[/b] Ariella directs the rukh to form a 10-15 meter wide area of force at 20 m/s within 30 meters of herself that increases the gravity in the range of the spell to inflict crushing force on opponents to inflict B-tier damage. [b]Description:[/b] Ariella directs the rukh to form a 1 meter wide fist of force within 30 meters of herself. The fist moves at 20 m/s to strike an opponent and inflict C-tier force damage and knock the opponent back 20 meters. [b]Appearance:[/b] Frolas is a small cat-creature with very large ears and is powder white. He comes complete with a collar and bell. [b]Appearance:[/b] One meter long deep purple serpent with matching wings that span two meters.